It supports the hardware accelerated h.264 encoder of Nvidia CUDA/NVENC, Intel Quick Sync video and AMD APP which allow video to be recorded in high speed, with a high compression ratio and excellent quality. 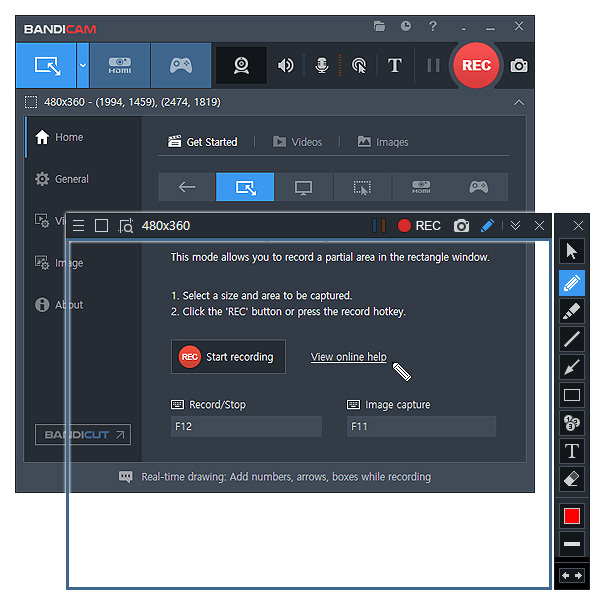 Bandicam compresses the video while recording and uses much lower CPU/GPU/RAM usage. It also can record 4K UHD video at resolutions up to 3840 x 2160 in size (1080p full HD/UHD video can be made) , and provides the ability to record multiple audio streams such as the PC audio and microphone at the same time. The maximum file size is unlimited as long as the local Hard Disk has free space available (Over 24 hours recording can be possible). 1. Bandicam now supports a real-time drawing function while recording the computer screen. 2. Users can simultaneously draw lines, boxes, or highlights while recording in the 'Rectangle on a screen' mode. 3. The recording target will be locked when the repeat image capture function is used.